Historic Carysfort Lighthouse, at the north end of the Key Largo Existing Management Area, sits atop one of the most remote reefs in the Upper Keys. In 1997, the Carysfort/South Carysfort Sanctuary Preservation Area (SPA) became the largest SPA in Florida Keys National Marine Sanctuary. The 1.5 square nautical mile area is one of the best developed reef systems in the Keys. Carysfort has an unusual "double reef" configuration. There is a proliferation of shallow corals, perfect for snorkeling near the lighthouse, but these thin out as the depth gradually increases. To the south of Carysfort Lighthouse, a broad expanse of elkhorn coral forms Carysfort South, a large shallow reef. Offshore, massive star corals loom over a labyrinth of under ridges, gullies, and an occasional swim-through tunnel. 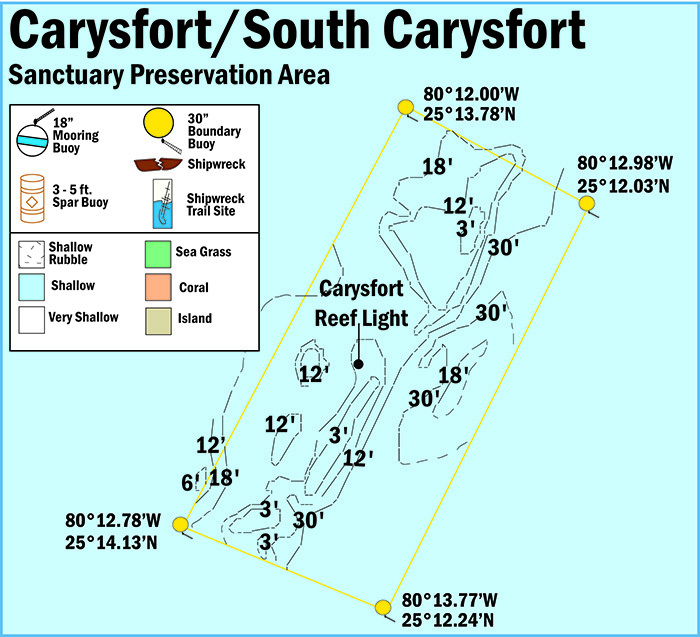 Carysfort is located within the boundaries of the Key Largo Existing Management Area, formerly Key Largo National Marine Sanctuary. View a map showing the location of mooring buoys within Carysfort Sanctuary Preservation Area.